Recipe: Chocolate Raspberry Bread Pudding | Dinner Love. I used one of Paula Dean’s recipes for the basis of this one, but didn’t actually follow it to the letter. I’ve never made bread pudding before so I wanted to get an idea of the ratio of bread to egg to milk to sugar to use. I love buying baguettes, but a consequence of that is that they always get too hard for me to use after a few days. To be honest, I usually end up throwing them away (which is really tragic considering I could have boatloads of homemade croutons by now) but this time I was motivated to make something of it. 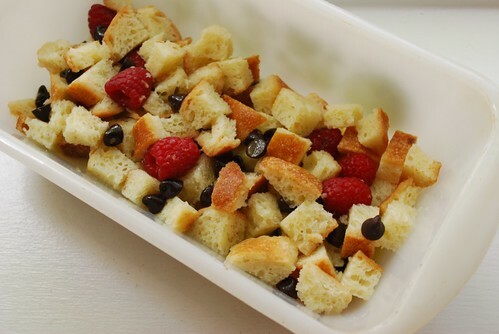 I had stale bread, chocolate chips, and some fresh raspberries that all needed using. Not to mention my 2 month blog absence (sorry…) and I knew I had something. I had…chocolate raspberry bread pudding, Dinner Love edition! Nomnomnom. 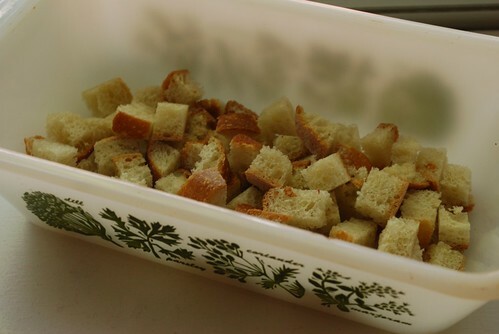 Cut your stale bread into little cubes. Put them into an oven-safe dish (I used my super-awesome vintage glasbake loaf pan) and set the oven for 350˚. 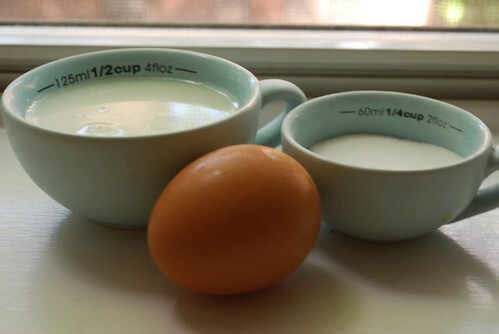 In a separate bowl, whisk together the milk, egg and sugar. 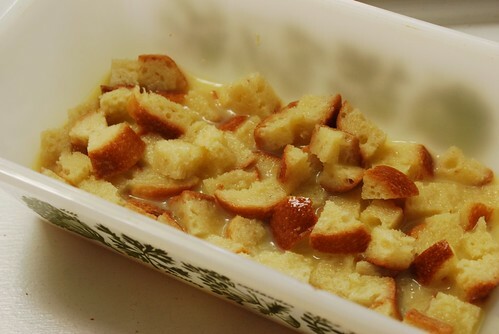 Pour over the bread cubes and stir to coat all of the bread bits in eggy sugar milk mix. Allow to sit for 10 minutes. 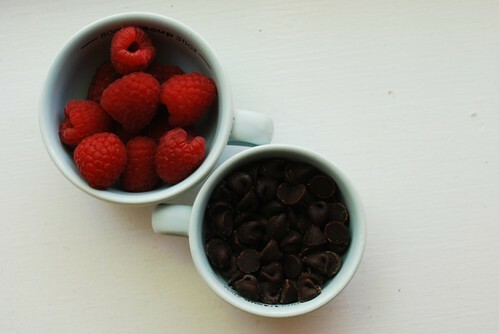 Add the raspberries and the chocolate chips and stir again. In a separate bowl, melt the butter and mix in the raw/brown sugar and the vanilla. 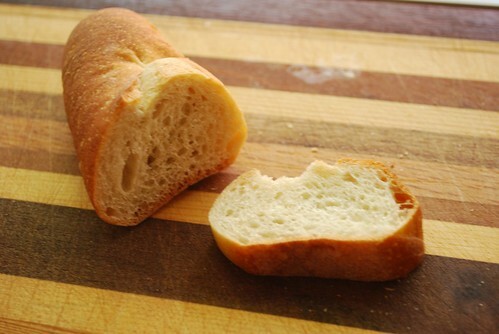 Pour all over the bread bits. Bake the bread pudding in the oven on a middle rack for 20 minutes. Allow to cool slightly and serve warm (or cold…but having had it both ways I’m going to say that warm is better). This makes…a tiny amount of bread pudding. The entire recipe would serve one to two people (depending on how greedy you’re feeling). Of course, you can always play with the amounts and make as much or as little as you want. I love that it isn’t too sweet, and that is probably why I ate the whole damn thing. Yup. ALL OF IT. It was like french toast on crack. And who doesn’t love that? Mmm I freaking love bread pudding!! You’re back! Welcome. I’m going to make this one for grandma! Great job! I love how crisp your pudding is! 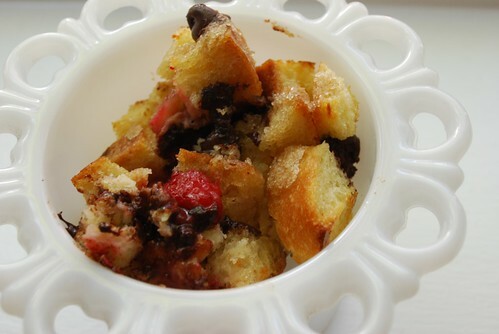 Love bread pudding so much and raspberry chocolate is a great way to make it just that much more tempting! 😀 Thanks for the recipe!